Hijo de Canis Lupus is the current IWRG Intercontinental Heavyweight Champion, defeating Mr. Electro to win the championship on April 14, 2019 in Arena Naucalpan. It's rare IWRG has a heavyweight among it's main roster of luchadors. This championship is usually fought for by national and Mexico City area independent name luchadors and occasional visiting major promotion luchadors. 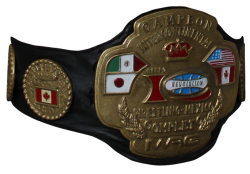 None are tied to IWRG, so the championship can go thru long periods of inactivity. Scorpio Jr. won the title on 2005.12.22 in Arena Naucalpan, defeating Heavy Metal. He held the championship until he jumped to AAA. As IWRG is aligned with CMLL, they stripped the championship from Scorpio (for inability to defend). To declare a new champion, IWRG held a relevos incredible match, with teams of Perro Aguayo Jr. (rudo) and Head Hunter I (rudo) vs Rayo de Jalisco Jr. (tecnico) and Canek (rudo). Rayo (the WWA World Heavyweight Championship at the time) and Canek won the tag match, which allowed them to square off for the vacant championship. Canek won the singles match and the championship. Canek defended the belt a couple of times in 2006, but issues with both knees caused him to wrestle less frequently, and miss large chunks of 2007, 2008 and 2009. Much in the same way he won the title, Canek lost it in a four-way. This one had masks, hair, and the title belt in the line, with the losers facing off for the reward. Scorpio Jr. & Pirata Morgan won the first part of the match, so it was Canek's title versus Mascara Ano 2000 Jr.'s mask. The younger wrestler won with a foul, becoming the 14th champion. Relevos Increibles to determine new champ; Perro Aguayo Jr. & Head Hunter I vs Canek & Rayo De Jalisco Jr.
↑ Lucha World Triangular de apuestas with Trauma I's mask and Hijo de Dos Caras' title on the line. Herodes Jr. was earlier on the match and got a victory saving his hair. This page was last edited on 20 April 2019, at 16:06.